This historic certificate is framed in our contemporary, wood, black frame which is 1" wide with an overall size of 12 3/4" x 15 3/4". Archival mounting, acid free backing, double matting and clear glass are used in framing this certificate. 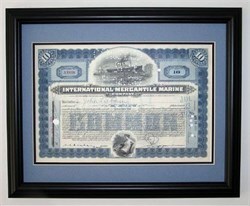 Our sales price includes the historic certificate, framing as described above, labor, packaging and shipping within the continental U.S.
International Mercantile Marine was a huge shipping trust formed in 1902 by J.P. Morgan. This company controlled the White Star Line which constructed three sister ships, the Olympic, Titanic, and Britannic, which are depicted in the top nautical vignette. The lower vignette features a lady in a nautical setting. Each of these three ships was identical in size being 882 1/2 feet long and 92 1/2 feet wide. The Titanic, which sank on its maiden voyage on April 15, 1912, after striking an iceburg at 11:40 p.m. on April 14, 1912, is perhaps the most famous ship of the 20th century. These stock certificates were issued in the 1920s or earlier and are in excellent condition. These certificates are hand signed by the company's officers and are over 89 years old. Small punch holes in the certificate are common and represent redemption and cancellation of the certificates.